A fire broke out on Saturday, February 17 at Tesla’s car plant in Fremont, California. This isn’t anything new, because we do hear about businesses that have fires from time to time. But, what makes this fire different is that it happened in an area where the company stores some of its hazardous materials outside. And, because of this, Tesla was forced to call the local Fremont Fire Department and required a hazardous materials unit. According to reports, Tesla has a history of fires at this facility. This includes a fire in their paint shop in April 2018 and another outdoor fire in August 2018. Add to this, Tesla was already under investigation by Cal-OSHA cited in January and fined $29,000 for allegedly violating six different worker safety regulations in their general assembly 4 (GA4) production line. Suffice it to say…this fire isn’t helping Tesla’s safety record with OSHA. So, what can businesses who store hazardous materials do to avoid Tesla’s potential catastrophe with that fire. Here are some very important things you should do. As a hazardous waste generator, you must satisfy safety, environmental and regulatory guidelines and have a solid base of knowledge and experience in using and handling hazardous materials in your facility. 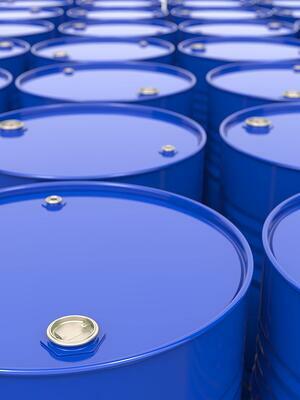 Using the right storage containers for different types of hazardous waste is the key to safety and compliance. All hazardous waste generators must insure that their containers are built to specification according to the most current codes and regulations. Following is a list of the different types of hazardous waste storage containers according to the Environmental Protection Agency website. Containers – portable device in which hazardous waste is stored, transported, or otherwise handled. Tanks – stationary device of man-made materials used to store hazardous waste, either open or closed. Drip Pads – wood drying structure used by the pressure treated wood industry to collect excess wood preservative and drippings. Containment Buildings – completely enclosed self-supporting structures used to store or treat non-containerized hazardous waste. Waste Piles – open, uncovered pile used for treating or storing hazardous waste. Surface Impoundments – a natural topographical depression, man-made excavation or diked area such as a holding pond, storage pit or settling lagoon. Proper storage and disposal requires you to understand which materials are toxic, what they do, the types of containers needed for storing the material and the type of personal protective equipment (PPE) that must be used. You can learn more about which container is right for you waste by reading our article, How To Choose The Right Hazardous Waste Storage Container. Identification of properties and the regulatory status of waste that you generate is vital in maintaining compliance with state and federal regulations. Hazardous waste generators that accumulate hazardous waste on-site in containers must be aware of the Resource Conservation and Recovery Act (RCRA) regulations regarding the proper labeling, marking and placarding requirements for hazardous waste containers. Date – The date upon which each period of accumulation begins must be clearly marked and visible for inspection on each accumulation unit. Hazardous Waste Notice – Each generator tank or container must be labeled or clearly marked with the words, “Hazardous Waste”. Name and Address – Name and address of the generator. Accumulation Dates – If waste is collected or consolidated in containers or tanks, the initial date of the accumulation must be marked, as well as the “90-day or 180-day period” dates, whichever applies to your company. If waste from an older container is added, the initial accumulation date will need to be changed. Recurring Waste Labels – “Recurring use” labels may be used on containers where same waste streams are initially collected and emptied into larger accumulation containers. The labels can revise the initial accumulation and “90-day period” dates (without having to change the other labeling information). If the container is emptied at least once each day, the word “daily” may be used in the date area of the label. You can learn more in our article, How To Properly Label Hazardous Waste Containers. According to federal and state regulations, every hazardous waste generator is required to have an emergency contingency plan. This plan outlines the company’s program to minimize hazards to human health and the environment from fires, explosions or an unplanned sudden release of a hazardous waste. You must maintain at least one copy of the contingency plan at the facility, but multiple copies is even better. In addition, copies must be submitted to local police departments, fire departments, hospitals, and state and local emergency response teams that may provide emergency services to the facility. Even if a facility will be providing its own responders, the contingency plan should still be sent to appropriate authorities in the local community in case of an off-site release or major emergency that requires their assistance. You can read more about how not having a hazardous waste contingency plan affected another company in our article, No Hazardous Waste Contingency Plan Leads To Big Fine For Manufacturer. The risks of working with hazardous substances and generating hazardous waste are great, and the consequences of a release, fire or spill can be dire. Many companies choose to outsource their emergency response as an alternative to training, equipping and maintaining an emergency response team in-house. And, some companies will have more than one company at their disposal to ensure availability when an event occurs. Emergency response companies have a fully-staffed, fully-trained hazmat emergency response team that are available 24 hours a day, 365 days per year. It is important to establish a relationship in advance to allow for fast response times, with experienced supervisors who coordinate with all responsible agencies (such as local fire and rescue) to limit liability and costs. 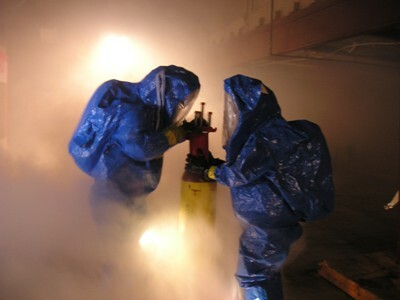 You can learn more about using a HazMat emergency response team in our article, What A HazMat Emergency Response Team Can Do For Your Business. Tesla serves as an example of what could happen to companies that use, generate and require storage of hazardous materials. Although nothing serious happened in Tesla’s recent fire, it could be much worse for your company if you don’t have the above procedures in place. If you need assistance with putting together your program, contact a hazardous materials company that specializes in helping companies create and maintain their program. Dawn DeVroom is the CFO at IDR Environmental Services based in California. The company specializes in hazardous waste disposal.